'The Backpack' lives. Alex Pardee will follow-up the sold out OG full color version with the monochromatic Depression Edition. Featuring his two symiotic-ish characters, the soft and cuddly duo make the perfect way to turn heads and maybe carry some of your isht at the same time. 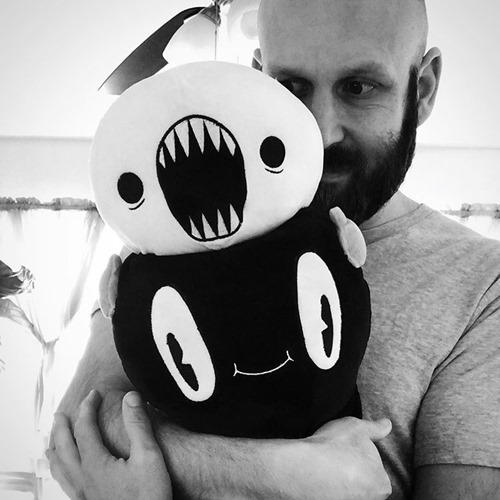 The Backpack Depression Edition will be available for pre-order starting tonight (3.14) at Midnight for $60 through March 20th from the artist's web shop. Pre-orders will include a free exclusive mono Backpack pin — a reward for those on the bleeding edge. 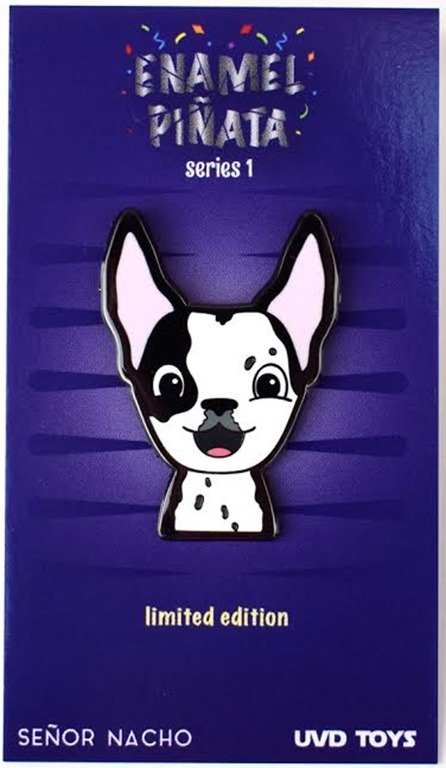 Having transitioned Playge from toys to lifestyle over the past few years, Ferg has released some of his signature designs characters as a series of metal lanyard beads. Today brings the Chamfered Sqube Lanyard beads. 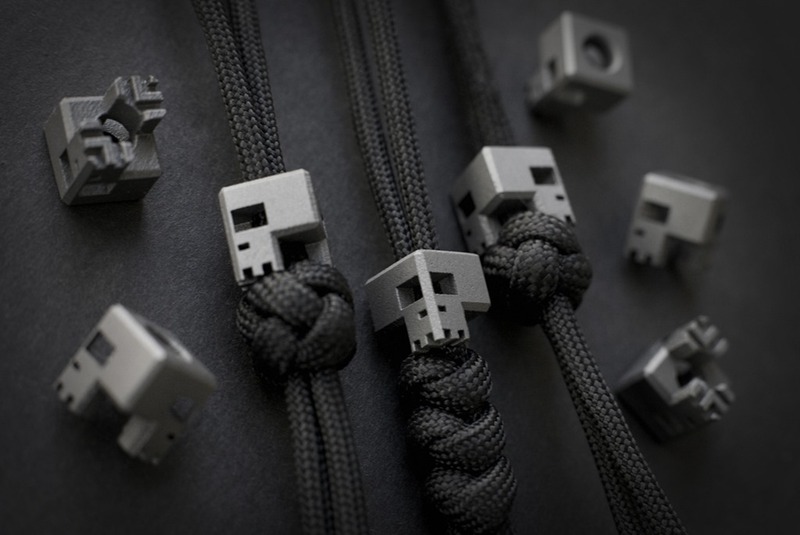 The .55" beads are crafted in medium-blasted titanium for high-end matte finish, work great at the end of a lanyard, or even interlock for a fun desk toy/display. 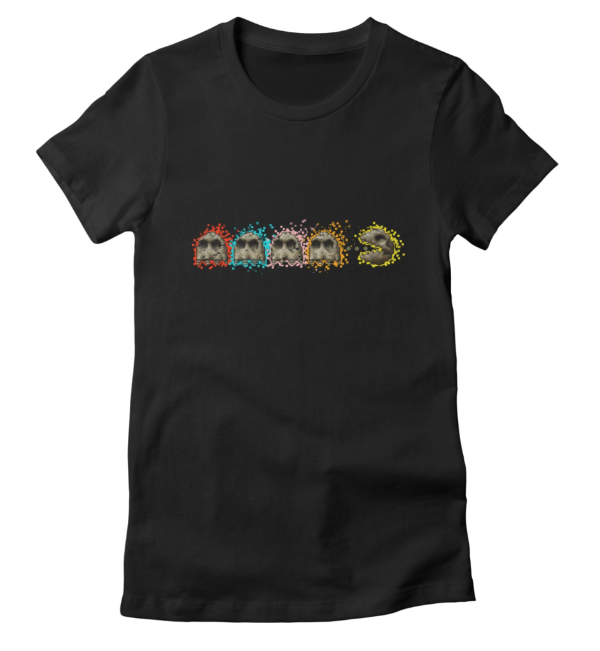 They are available now for $56 each (includes USA shipping0 from the Playge shop. 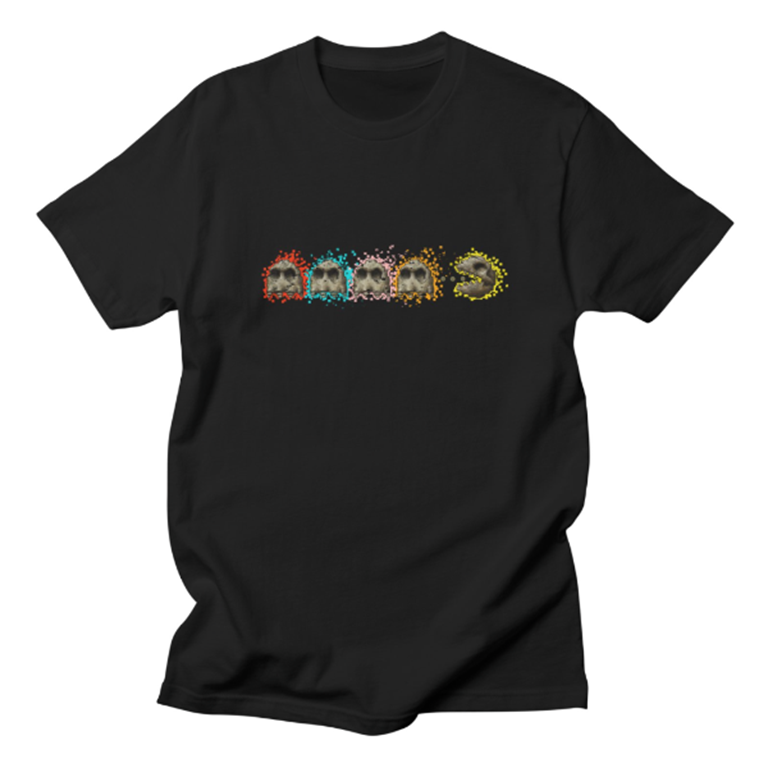 Looking to up your T-shirt game in 2019? Alex Pardee has you covered with his brand-new Shunderland shirts. 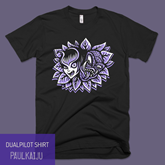 Featuring a polka-dotted bundle of joy, the shirts will be available in both black and white colorways this Thursday (1.10) at 4 PM from his web shop. 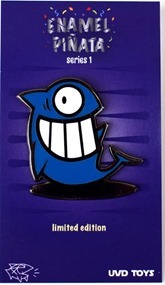 Plus…the first 75 orders will score a bonus Shunderland enamel pin. These are expected to ship at the end of the month. Vannen Watches has released the new Octopup Watch from Chris Ryniak. 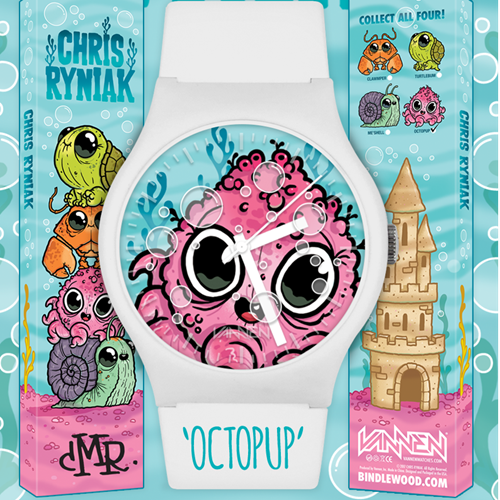 The third in his aquarium series, Octopup features a pink octopup face design with a white case and band. 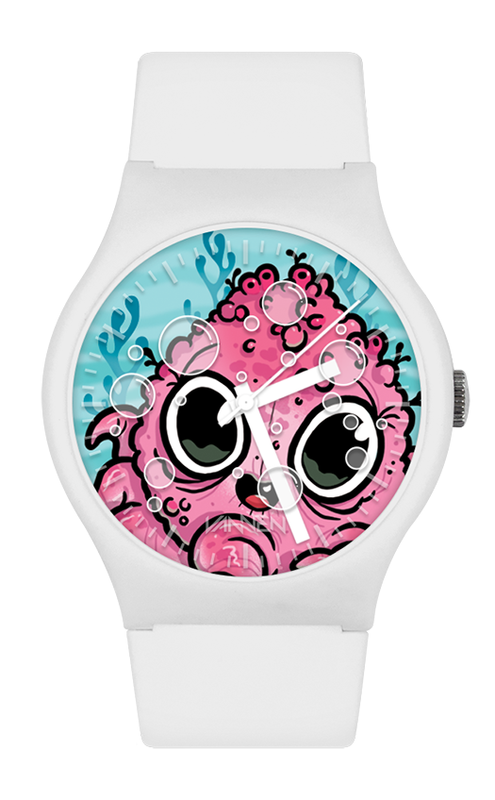 Bubbles printed on the watch crystal add a fun touch. Time to get wet! 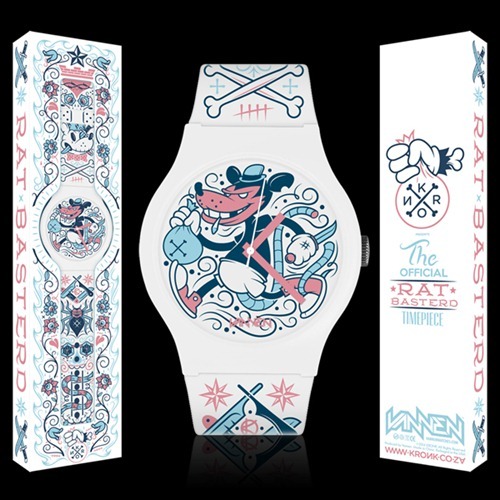 Available for $60 from Vannen’s online store, each watch comes with an exclusive sticker and packaging signed by the artist. 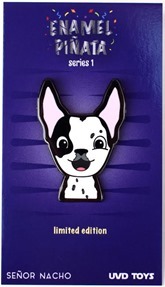 UVD Toys is happy to announce their first series of hard enamel pins, dubbed Enamel Piñata. They’ve got some amazing talent a part of their first run of limited edition figures, such as Senor Nacho, Mike Giant and Pez. 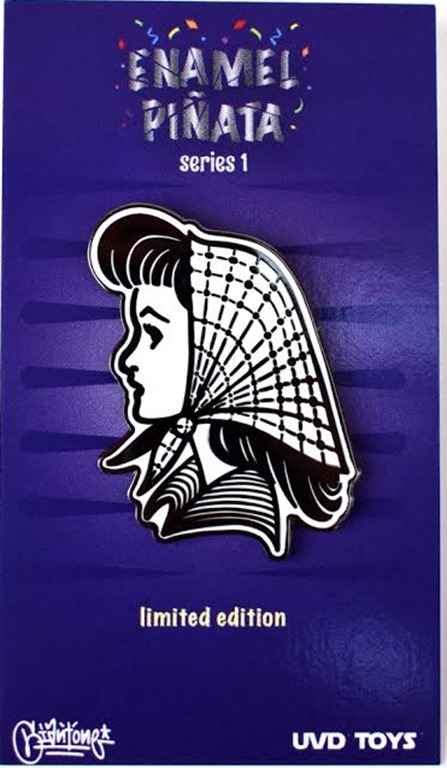 Each pin measures 1.5” and can be found available HERE for $10 a piece. Add any one of these to your hats or jean jackets and you’ll be getting all the compliments! 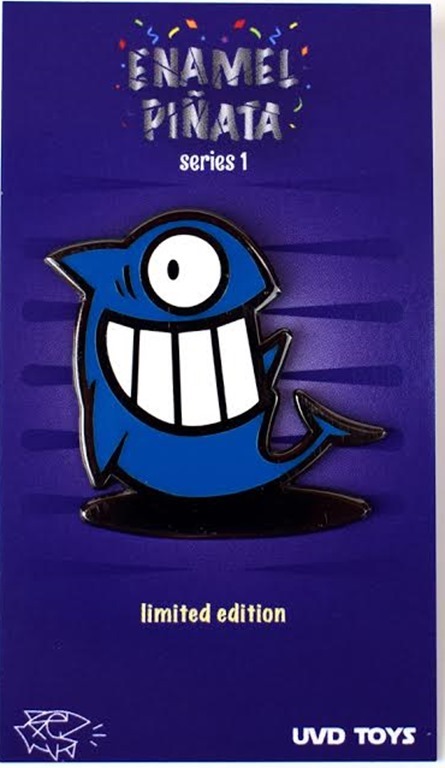 MAD has joined the ranks of enamel pin making! 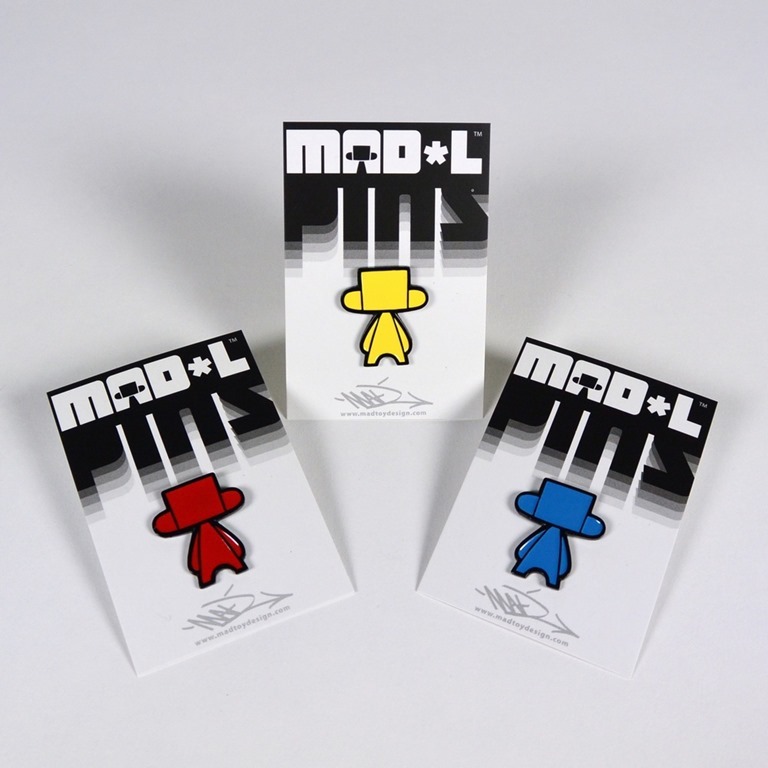 Now you can add some MAD*L flare to your jean jacket, tote bags or backpacks! The MAD*L pins measure 1” tall are available in Red, Blue and Yellow at $10 a piece. 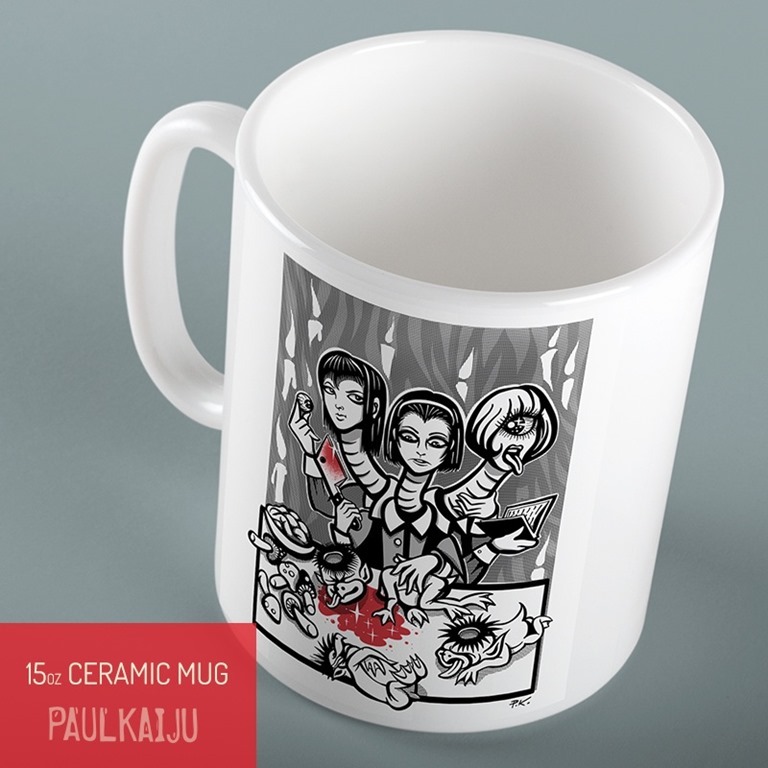 You can find them available now HERE while they last! Branching out into apparel, De Korner launches its Xhbt-X lifestyle brand with its first Tee. 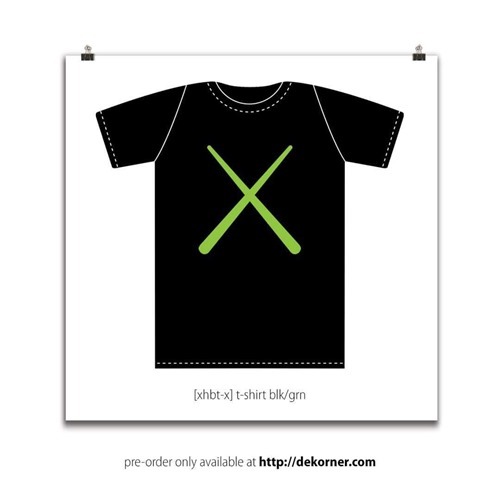 The simple design features what initially appears to be a neon green X on a black background. Looking closer reveals that design actually features two crossed chopsticks. Limited to 100 pieces, Xhbt-X’s debut tee is available for pre-order for $19.99 ( + s/h) over at De Korner. 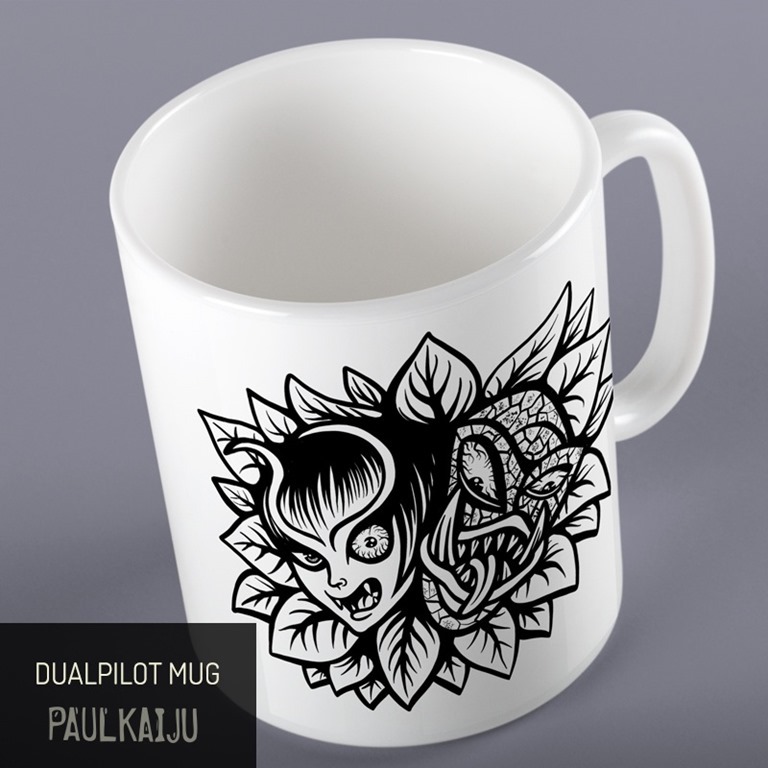 Paul Kaiju just added some rad merch to his online store! Not only can you rock some PK on your toy shelves, but now you can in your kitchen, office and pretty much anywhere you go! 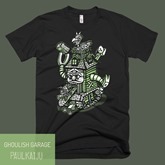 When it comes to wearables, there is the new Dual Pilot, Ghoulish Garage and Wiggle Room t-shirts, which all retail $28. 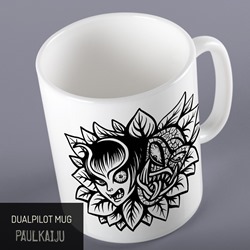 Perfect for your coffee or tea are a ceramic couple mugs, which features the Dual Pilot design in a 11oz mug and the “Have Another Kappa” in a 15oz mug that both retail $20. Check them all out in his shop HERE. 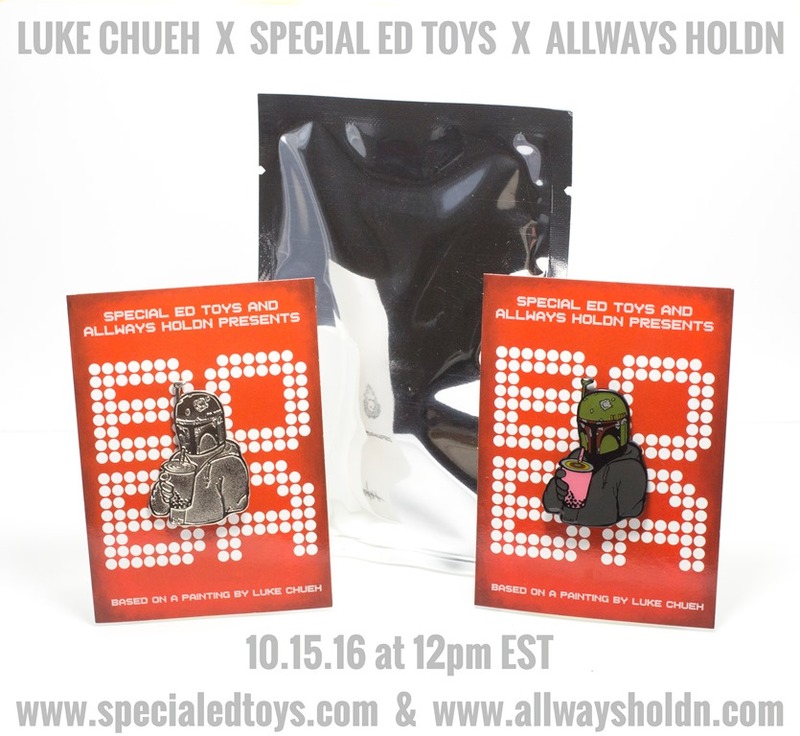 Special Ed Toys and Allways Holdn have teamed up with Luke Chueh to produce his very own line of enamel pins based off his Boba original painting and figure. Each pin measures 1.5” and feature a poxy sealer to give it a nice shimmer. These are released in blind bags with a chance to score yourself the super limited silver edition. Each blind bag will retail $15 each HERE. If you aren’t up for the hunt, you can score both regular edition and silver chase HERE for $60. If you so happen to be a completest and missed out on the GID edition, you can get all THREE HERE for $80. Every Tuesday, Bob Dob will be releasing a new t-shirt through his Threadless webstore. Some of the designs will be completely brand or or from past paintings. 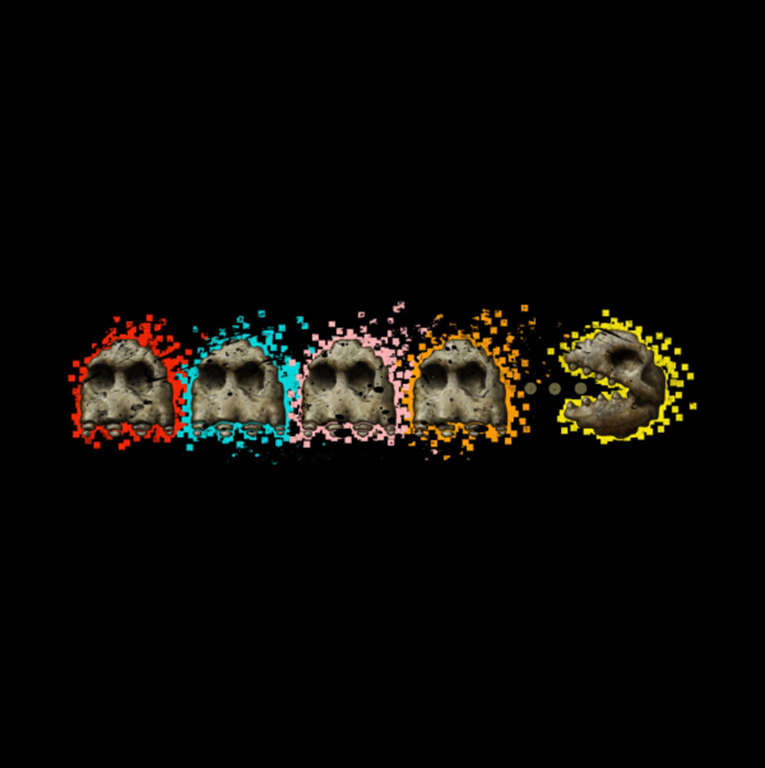 His latest design to join his store is the “I Want Your Skull” design. These will be printed in limited numbers and are up for grabs in either Mens, Womens, Youth. 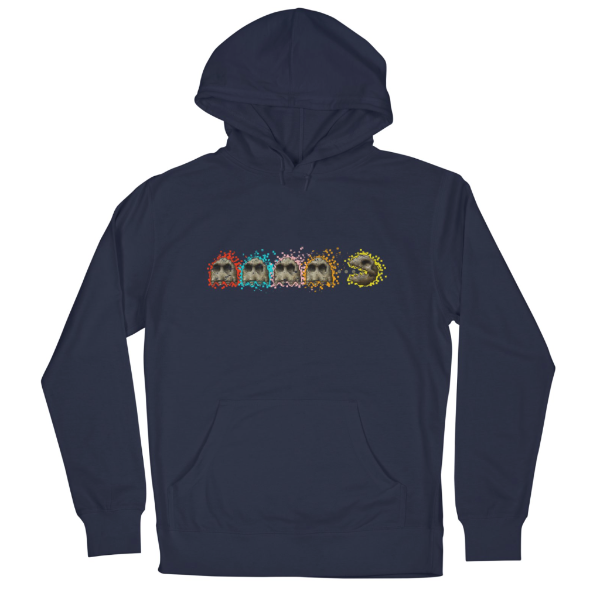 You also have the option of printing on a t-shirt, hoodie, zip-up or long sleeve! Prices range from $18 – $40. Check them out HERE. Huck Gee’s Blank Black Variant watch has dropped from both HuckGee.com and VannenWatches.com for $65 each. The watch features a black case, a gray and black dial featuring the Skullhead Blank, white hands, and the kanji for death printed in red on the crystal itself (nice touch). Each of the watches comes in a signed/numbed package. It seems that Kidrobot is looking to once again offer lifestyle items in addition to their various toy lines. 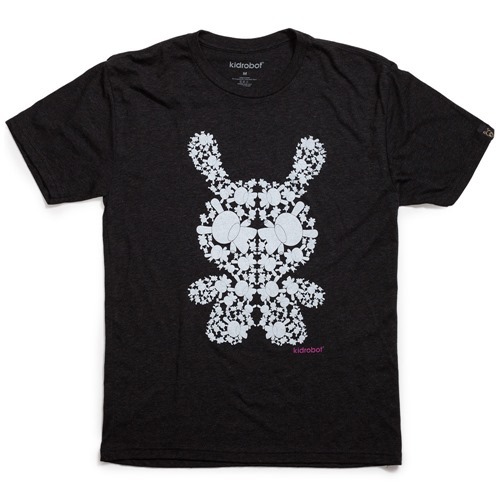 As part of what is so-far a slow trickle, the ‘bot has released the clever, design-forward Rorschach Dunny Tee in both Men’s and Women’s styles for $24.99 each. While we’re not sure staring deeply into the design will reveal the inner workings of your psyche, we’re pretty sure you’ll see *lots* of Dunnys. 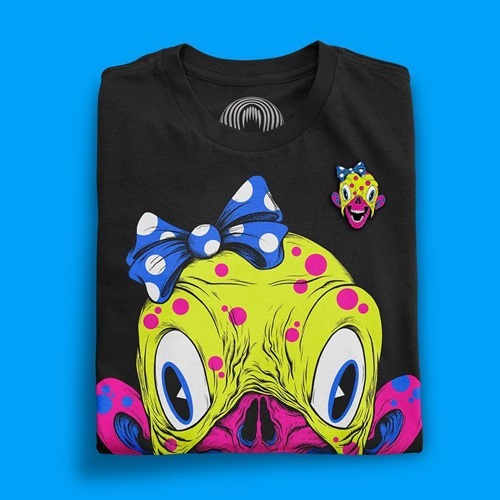 With the recent Dunny skate deck and now this tee, maybe a new cap is next ? 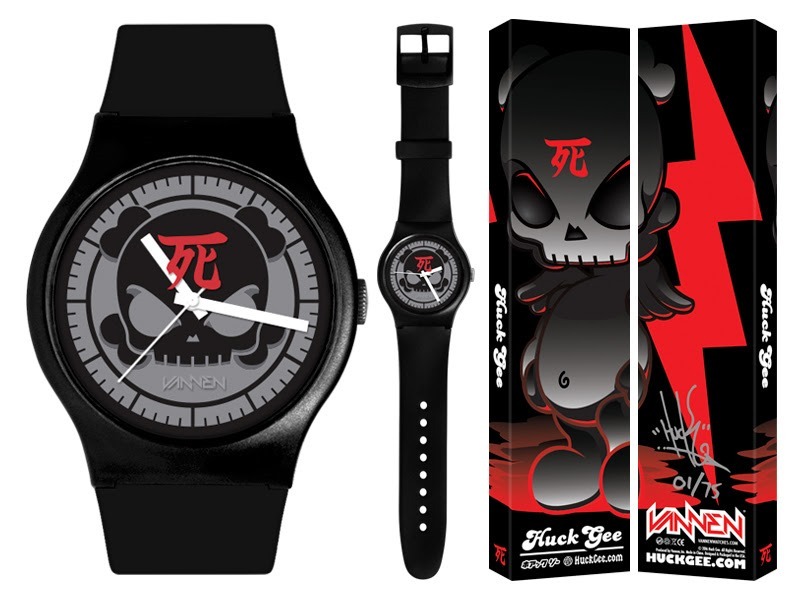 Huck Gee and Vannen have teamed up once again on a brand-new watch based on his new Skullhead ‘Blank’ DIY figure. 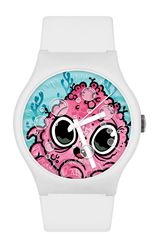 The white XL watch features his signature character’s face against a gray background. An illustration of the full character graces the packaging. Compared to Vannen’s previous two Huck Gee watches – Killing Time (2010) and its counterpart Lifetime (2011), the new design features a more minimalist design with a clean white brand rather than the previous printed bands as well as a straight-ahead portrait rather than a slightly askew one. Limited to 150 s/n (on the box) pieces, The ‘Blank’ watch will be available on Friday (2.19) at 10 AM PST for $60 (+ s/h) from both HuckGee.com and VannenWatches.com. 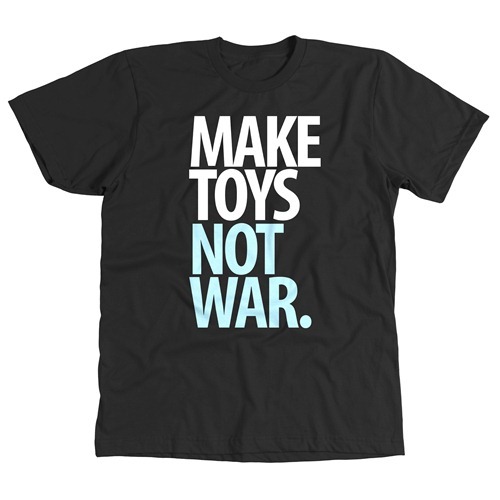 Pobber’s Make Toys, Not War Tee has proved to be quite popular. So much so that they are bringing it back with a new classic monochrome edition, white on black, starting this Friday (7.17) from the Pobber store for $25. If you’ve got a keen eye, you’ll notice that the new release varies slightly from the ones released last summer. This “classic” edition follows the design worn by the Pobber crew at the various conventions – lower case letters, with a comma between the phrases. Marka27’s Minigod sneakers from the artist-focused Bucketfeet brand let you walk to a different beat. Both the Men’s and Ladies’ designs are now available online from Bucketfeet for $68 (free shipping). 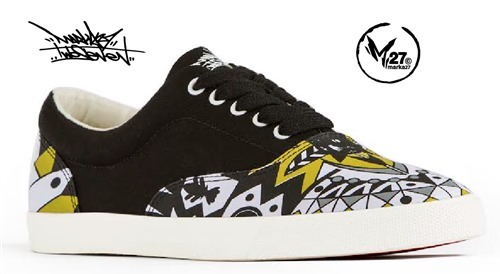 Plus, take an additional 20% off any Bucketfeet sneakers by using the MARKA20 checkout code. 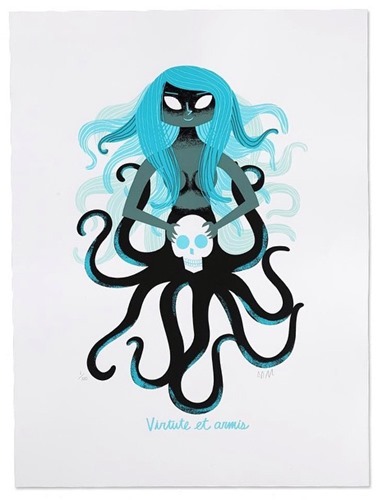 Riffing off Mark Hoppus’ (Blink-182) signature octopus character/logo, Amanda Visell has worked with his lifestyle brand Hi My Name is Mark on a new collection based around her original illustration, ‘Virtute et armis’ (By Courage and By Arms). First off there’s a limited-edition art print (100 pcs, 18” x 24”, $70). 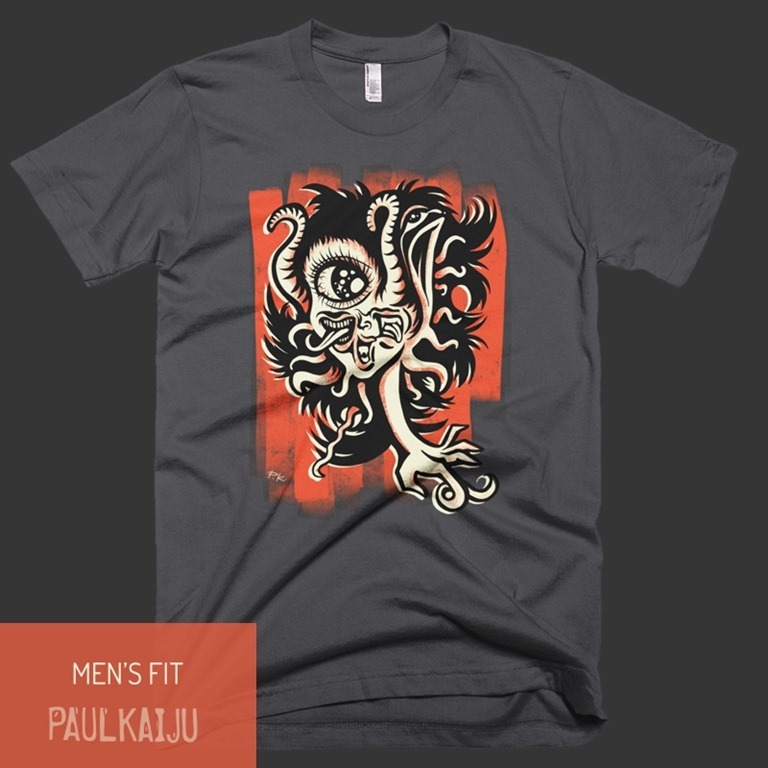 For those of us who enjoy wearing our art, there’s also a Tee in Charcoal and Navy ($32) and a tank-top in white ($28). Freak Store – Fonzo World Relaunch! 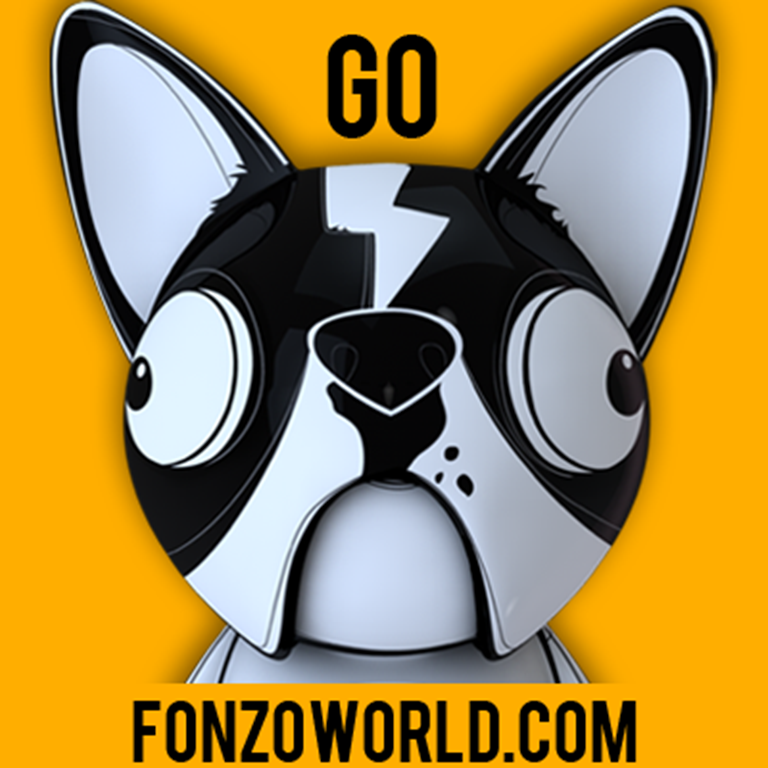 Freak Store in Venezuela has just launched their new international website, Fonzoworld.com. Along with the brand new site, they will be launching a brand new clothing brand featuring some of their favorite artists, such as: Patrick Wong, Burundanga, Hydro74, ILoveDust, Muxxi, Theo Badiu, Jesse Phillips, Patricio Oliver, 64Colors and Gary Ham seen HERE. They will be carrying all of your favorite Kidrobot goodies and of course their line of Fonzo vinyl figures! Angry Woebots is branching out. 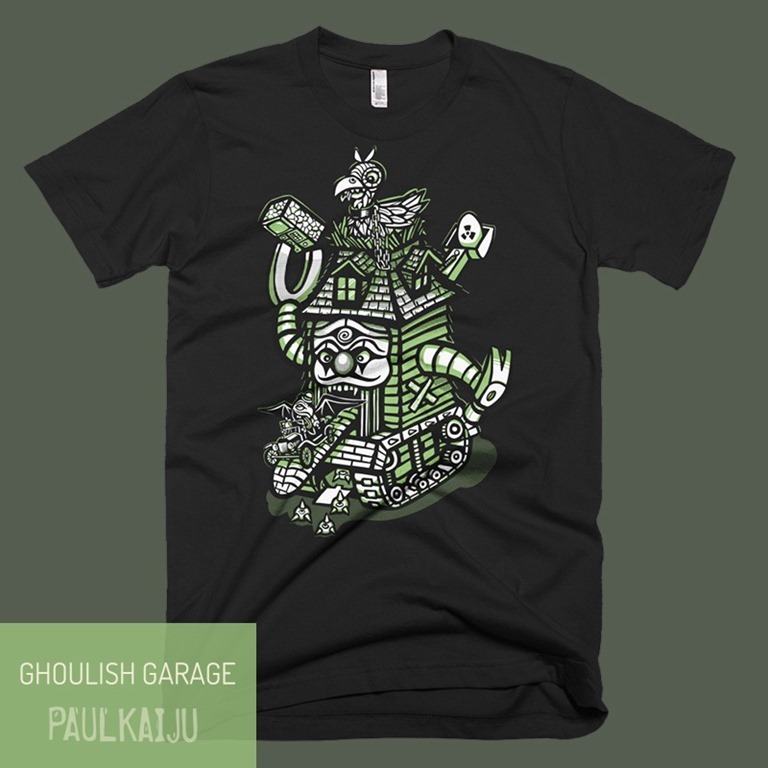 His new KNKLSNHUGS project combines and mashes up his favorite things. 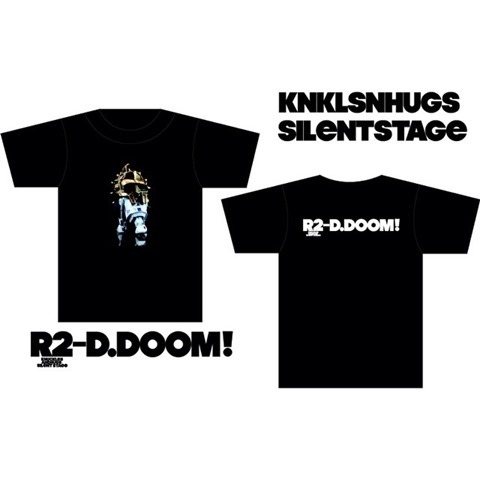 First up is the Hip Hop meets Lucas R2-D.DOOM Tee in collaboration with Silent Stage. 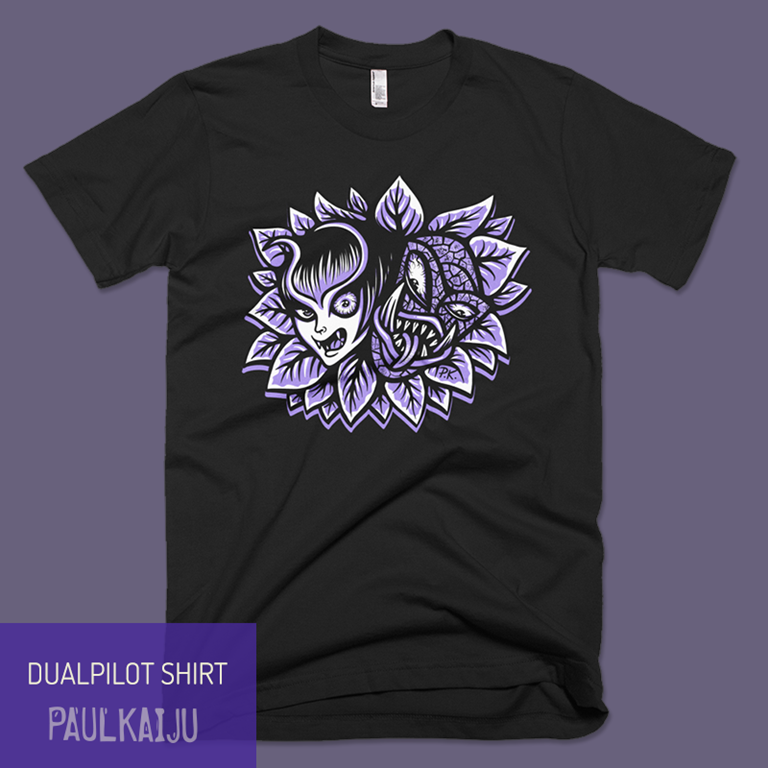 The shirt is available now for $30 (+s/h) over at the Silent Stage web shop. Early this month, Vannen brought word that they were working with 3DRetro to release a limited-edition Kronk art watch at San Diego Comic-Con. Now they’ve released images and details of the new watch –- a White edition of the OG Rat Basterd watch, which dropped last fall. The White Rat Basterd will be available from the 3DRetro booth [#5049] beginning on Preview Night (7.23) at a special price of $60. Act quickly at SDCC if you’re planning on buying one since the first 30 people to buy the new watch will receive a free bonus limited-edition Kronk giclee print. 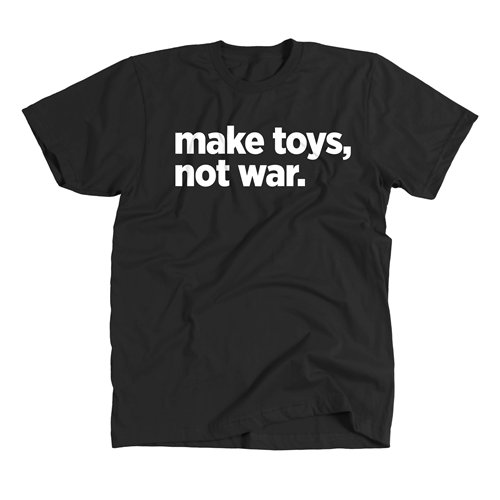 Singaporean toy brand Pobber created their ‘Make Toys, Not War’ T-shirts for the Art Toy Culture Korea show back in May. 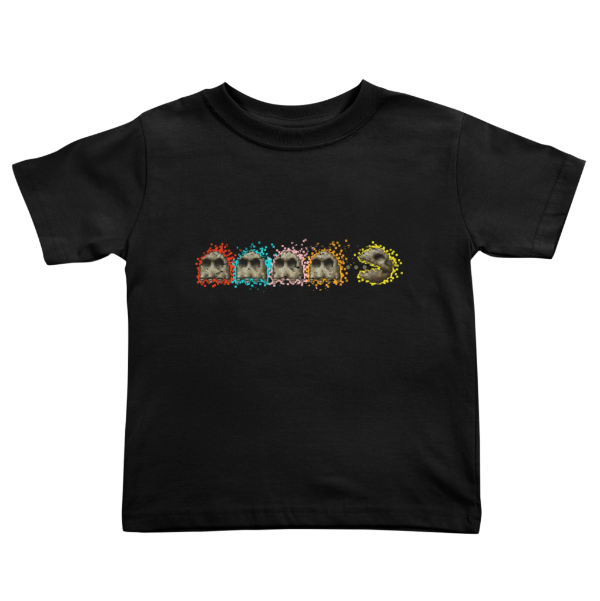 Now, due to collector interest Pobber will offer the shirt in both black and white designs in a much more accessible online release on June 6th @ Midnight for $24 (+ s/h) from Pobber.com. While both work, we’d go with the black for the two-tone text. You might be familiar with the Chinese Zodiac and Lunar Calendar which mark 2014 as the ‘Year of the Horse’. But do you know how each of the twelve animals earned that honor? To answer that question, Mini Magellan has released Jade Stars: The Great Race, a children’s book illustrated by Jerome Lu and written by Charles Huang and Stacey Hirata which presents the classic tale in a fun, fresh, & kid friendly way. The hard-cover book ($17.99) unfolds the Jade Emperor’s fabled race over 24 full-color pages. To bring Jerome’s versions of the Chinese Zodiac characters to life, Mini Magellan asked Patty Varoiba (Fat Rabbit Farm) to create large plush toys as a companion to the book. Currently, there are three plushies – Year of the Horse (17”), Year of the Snake (14”), and Year of the Ram (19”), each with a suggested retail of $59.99. If your birth year animal hasn’t been given the plush treatment yet, don’t worry; Mini Magellan is planning to create plush versions of all twelve of the Chinese Zodiac animals. 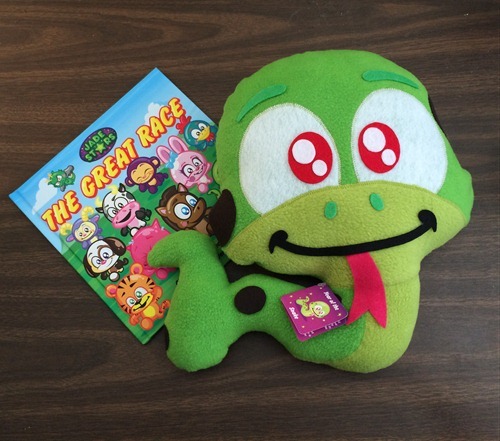 If you have a little one, Jade Stars: The Great Race will make a fine and fun addition to his or her growing library. Having had a chance to 'play with the Year of the Snake plush, the oversized, detailed, =undeniably cute, made in the USA plush is easy to recommend. The book and the plush toys are available now from MiniMagellan.com and should soon be available at retailers around the country. Freak Store’s Fonzo is steppin’ out. First there was the popular platform toy and now Fonzo is the star of his very own artist tee collection featuring designs from 64Colors, PO!, Hydro74, Gary Ham, I Love Dust, Jesse Phillips, Patrick Wong, Theo Badiu, Muxxi and Burundanga. Look for these soon from your favorite art/toy retailer for $24 each. 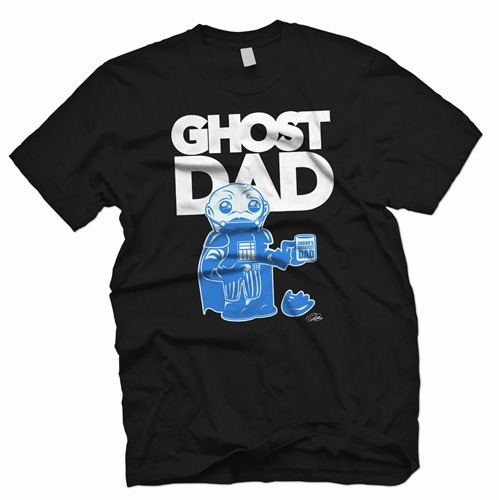 Just in time for Father’s Day, Outsmart Originals is taking pre-orders for the new Ghost Dad shirt (limited to 48 pcs) by Pocket Wookie. 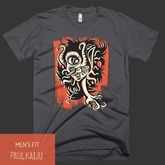 Based on the artist’s A Lame Time Ago trading card series, the new shirt conjures up a humorous take on Fatherhood. It’s available for pre-order now for $20 from Outsmart Originals which works perfectly with the brand’s limited time free domestic shipping on orders of $20 or more. 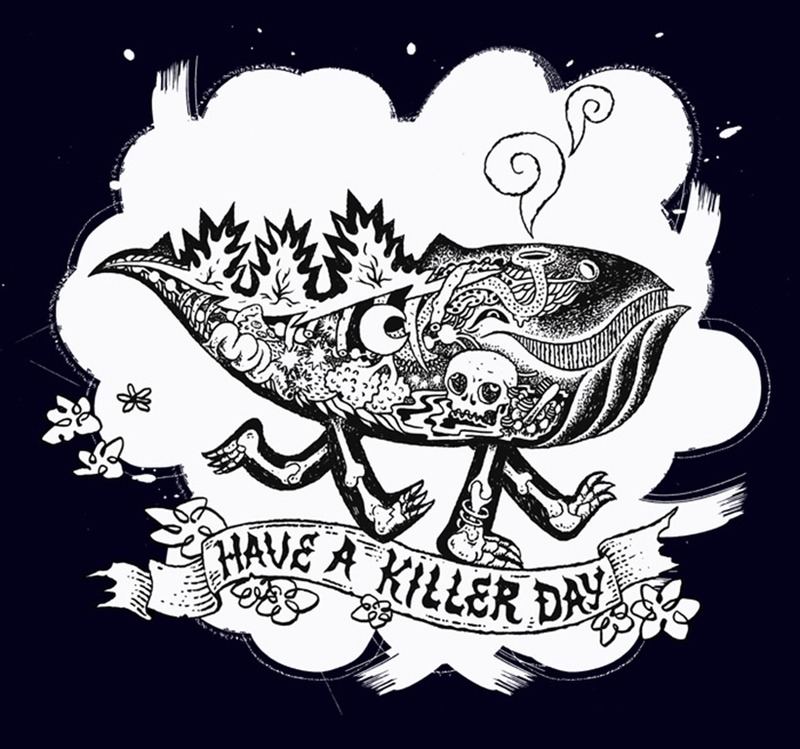 Hey Farts, Bwana Spoons made a super cute Killer tee. I hear you can telegram some paypal $28 for USA or $33 for Earth to rainbowmaster[at]earthlink[dot]net for one (I guess earthlink still exists) or go buy at his fancy Store and look at other things. You should check out his store anyway. So many things are unique and one of a kind and he's sneaky about sticking fancy things up on that junk. 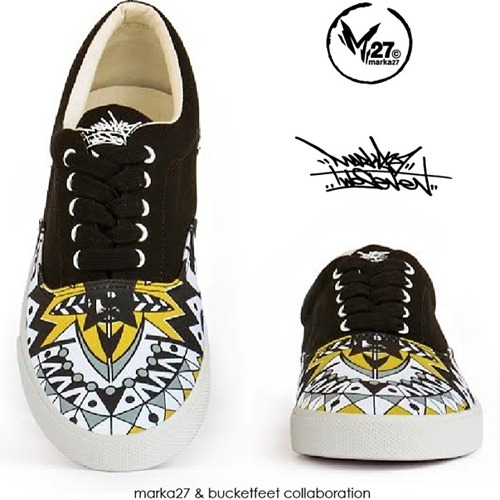 Marka27 is collaborating with artist brand BucketFeet on a pair of Minigods production sneakers. Marka’s design echoes the toys with the geometric patterns on the upper and the heel. No word on a release yet, but expect both a men’s shoe (above) and a women’s shoe with added polka dot detail (after the jump).